The school operates a serving kitchen. School Meals are prepared and cooked at St. John’s school kitchen by Chartwells and delivered each day and the menu is run on a three week cycle. The Government introduced statutory infant Free School Meals in September 2014 for Year R, 1 and 2. The price of a school meal for Year 3-6 is currently £2.00 per day and water is provided to drink. School meals can be ordered daily, meals can also be ordered on set days of each week, but must be booked for in advance. Special dietary requirements can be catered for, please contact the school office for a form. If you wish to change your child school meals arrangements, 48 hours notice is required. Payments are made on-line via ParentPay. These should be brought to school in a suitably sized container to fit with our ‘special slots’ that measure 22.5cm x 14.5 cm x 25 cm. Please ensure your child’s name is clearly marked on the container. A balanced healthy lunch box is encouraged. Teaspoons will need to be provided for yoghurt/mousse desserts pots. Healthy drinks are recommended. Nuts, sweets including chocolate bars, fizzy drinks are not permitted. We have looked at the standards that school meals have to meet and applied these to our guidelines for packed lunches. Water – should be the only drink provided as this is in line what is provided for children having school meals. Crisps – on a Friday only as this is the day when school meal children have chips. School meal standards limit the amount of fried food in a week and so we want to reflect this in our packed lunch guidelines. Fruit and vegetables – at least one portion a day in a lunchbox as school meals provide this too. Pudding – one portion of a sweet food such as a yogurt or chocolate biscuit a day, just as school meal children have one portion of pudding. Each child needs a water bottle when they join school. In the interest of health, children must bring their water bottles filled with water to school each day, the bottles can be refilled in school from water coolers which are readily accessible to all. Bottles should be clearly labelled with the child’s name. Three water fountains are available outside in the playground areas. Free milk is provided for children under 5 years. Paid milk is offered to pupils over 5 years old. The school takes part in this scheme. This is a national government programme entitling all children aged four to six in infant, primary and special Local Authority maintained schools to a free piece of fruit or vegetable each school day. They may be given an apple, pear, banana, satsuma, carrot, some cherry tomatoes or other fruit or vegetable – it depends what is in season. 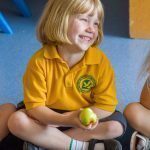 Children in years 3-6 may bring in a piece of fruit/veg to eat at morning break. At St. Johns we are involved in promoting healthier eating and the general well being of children and the school community including pupils, staff, parents and governors. The pupils exercise daily with a five minute warm up to music in the classroom. Healthy eating is encouraged at our Breakfast Club and After School Care Club along with the partnership of the school meals service.